In part 11 of the Node.js Learning Path, I introduce you to ExpressJS. This course wouldn’t be complete without introducing at least one web framework, and I’ve chosen ExpressJS because it’s one of the most popular web frameworks in the Node ecosystem. It’s also the basis for others like Loopback and krakenjs. Express is minimal, fast, and has tons of contributions built on top of it. You are very likely to encounter this framework as a professional Node developer, so you should be familiar with it. Middleware: The code used to process the HTTP request-and-response objects. Routing: Matching a URL path to a function for handling. View processing: Rendering an HTML page based on a page template and request data. Data validation and sanitization: Comparing request data to validation rules, and ensuring the data does not contain exploitative data. This tutorial introduces you to the above modules. If you need more functionality, contributions extend that minimal core. This tutorial is part of the Node.js Learning Path. The units build on each other, so check out Learn Node.js, Unit 1: Overview of Node.js Learning Path to start at the beginning. 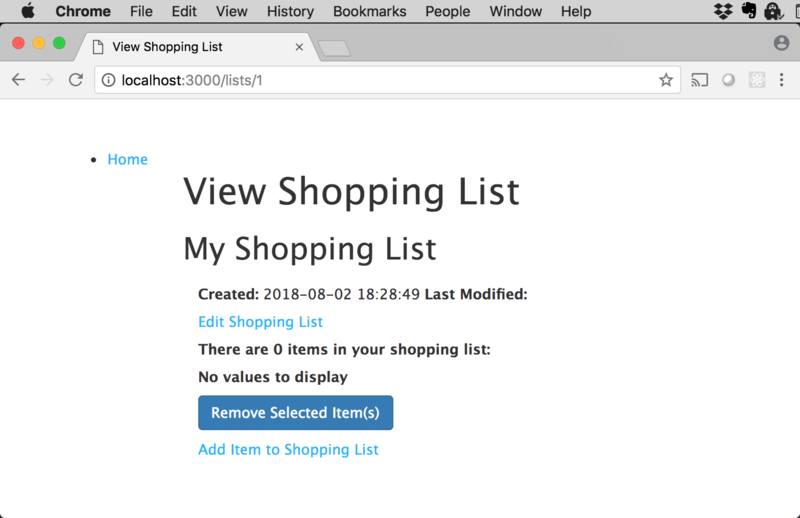 I’ve converted the Shopping List application from Unit 6 to use Express, and added a GUI so you can use a browser to interact with it. You’ll find the code in the GitHub repo for this course. Navigate to the Unit-11 directory in your local copy of the GitHub repo. Run npm install to install the necessary packages from the npm registry. Load the data into the SQLite3 database: npm run load-db. Start the application: npm start. Point your browser to http://localhost:3000. Now you can begin working through the material, using the source code and the running application as a reference. As you play with the application, see if you can match the screens in the UI with the modules, pages, and other source artifacts, so you can learn how they work. In this unit, you’ll work with an enhanced version of the Shopping List application from Unit 6. When converting the previous version of the application, I first ran express-generator to create a basic project structure, then created new directories on top of that. Listing 1 shows the final directory structure. Ix:~/src/projects/IBM-Developer/Node.js/Course/Unit-11 sperry$ tree -d .
I suggest taking a moment to look through the directories and familiarize yourself with the code. Doing this will help you move more easily through the rest of the course. In the next sections, we’ll explore the core modules of an Express application. An Express middleware function sits between the HTTP server and the application’s business logic, and has access to HTTP request-and-response objects for processing. Middleware functions are installed via the use() function. Express applications use middleware to perform many functions related to handling web requests. Normally, a single middleware function does a single task, then sends the request to the next middleware function for further handling. Some middleware functions are provided by the Express core, such as for parsing the request body or handling static resources. Other middleware functions are provided by contribs, such as for cookie parsing and HTTP error handling. There are also Node API packages for things like path processing. Some middleware, like routing, you provide yourself using the Express Router, which I’ll introduce in the next section. Note: The root directory for all source code in this unit is Node.js/Course/Unit-11/. All file locations and paths are relative to that. The entry point for an Express application is ./bin/www.js, whose main job is to create the HTTP server. To create the server, ./bin/www.js uses the Express configuration contained in the main module, which is called app.js or server.js. The configuration in ./app.js is pretty simple. I’ve broken it into sections to make it easier to describe. Note: No path argument implies the middleware is applied to all paths (/). Note: Error-handling middleware uses the http-errors module. Listing 2 shows the app module in its entirety. The order of calls to app.use() is important because the middleware forms a “chain” that is executed in the order you call app.use(). Middleware will either handle the request and re-route it to some other URL/path/etc., or it will pass the request along to the next link in the chain, via a call to the Express next() function. There’s good reason the error-handling code is at the bottom of the chain: if a request has reached the error-handling middleware, it means that no other middleware has handled that request, or an exception was thrown along the way. At that point, the error handler receives it. The Express documentation has a nice document about using middleware. Check it out if you want to learn more about executing the middleware chain, and how to write well-behaved middleware. A route is a mapping between the path portion of a URL and an endpoint in your application, such as a page or business logic in a REST function. Routing is the process of mapping an HTTP request specified by a method like GET or POST, along with a URL path, to a callback function to handle the request. 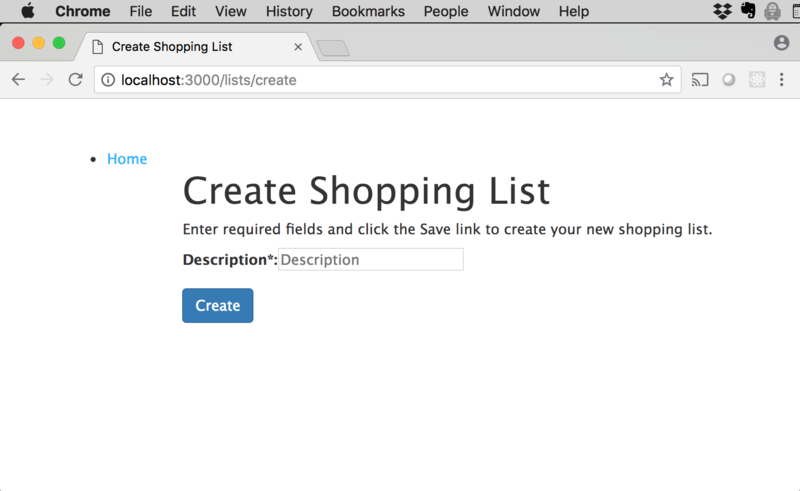 Unit 6 introduced the routing functionality for the Shopping List application, and you completed that functionality as an exercise. The routing used to map an HTTP method/path combination to a REST service was fairly primitive, not to mention tedious. In this unit, you learn how much easier Express routing is. index.js defines the “default” route. rest.js holds route definitions for REST services provided by the Shopping List application. lists.js holds route definitions for view-related routes served by the Shopping List application. We’ll start with the REST service routes, which are summarized in Table 1. Routing code is easy to write in Express. After require(express), you call the express.Router() function to create the router. On the router, you call functions that match the HTTP method you need to handle, such as router.get() for a GET request, router.post() for POST, and so forth. The route path is the path portion of the request URL, which can be a string pattern or regular expression. The route handler is the controller function that handles the route. The routing for every path in the Shopping List application is done in two phases. The first phase involves the topmost part of the path. Typically, a router’s module name matches the part of the path it is used to route. In this case /rest is the path, and so rest.js is the module name. All routes whose URL paths match /rest are forwarded to the rest router for further routing. The router then examines the remaining part of the path to determine its final destination. This example shows how routers can be combined to modularize routing. The Shopping List application is simple, and the paths are not that complicated, so a pair of routers does nicely. Complex applications typically have longer URLs and more complex routing, so being able to stack routers is very handy. Whenever the /rest path is matched, the restRouter (in the rest module) is invoked to handle mapping the remainder of the path. Note that in the rest router you don’t have to map the /rest part of the path again; you only need to specify the part of the path after /rest. The router attempts to find a “greedy” match between the path portion of the request URL and the paths in its routes. It will execute the callback function for every matching route. A route is a unique combination of the path and HTTP method. If two or more routes match a single incoming request, all of those routes will be executed. The Shopping List application’s routes are all unique, but in another application you may need to handle the same route in different controllers (to decorate a request, for example). Express provides this capability. The path portion of this URL by itself is ambiguous, matching both of the /rest/lists routes above (lines 10 and 12, respectively). Express looks at the HTTP method specified in the request to determine which route matches. If the GET method is specified, then restController.fetchAll() will be called (line 10). If POST is specified, then the restController.create function will be invoked (line 12). In a typical Express application, routes are located in a ./controllers folder immediately subordinate to the project root. The controller module for the rest router, called rest-controller, has a function for each route. req: An Express Request object, which represents the HTTP request. res: An Express Response object, which represents the HTTP response. next: An Express function used to pass along the request to the next middleware in the chain. Let’s walk through the create() function. First, we retrieve the request body as a JSON object (thanks to the express.json() middleware). As part of the POST request, the caller sends the description attribute of the shopping list to be created in the request body. The express.json() parses it and makes it available in the req.body.description property. 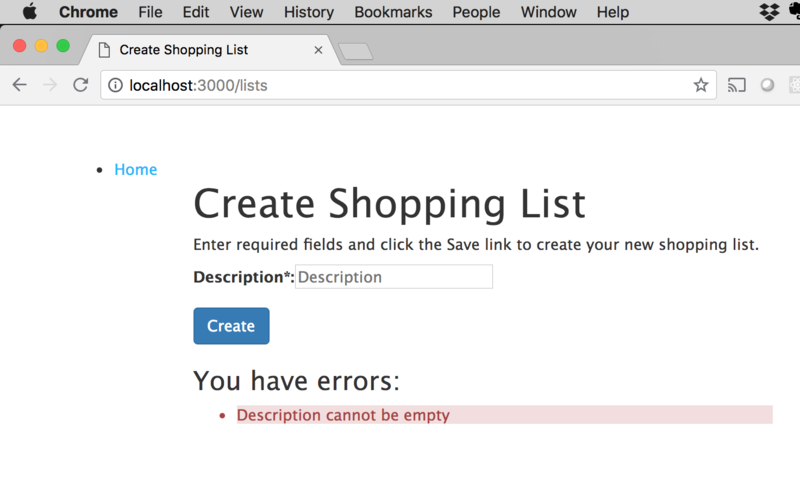 Next, we call listsDao.create and pass the description of the new shopping list. If that succeeds, we call utils.writeServerJsonResponse() (the same function from Unit 6) to send a JSON object response and status code 200 to the caller. If an error occurs, then we simply pass it to the next middleware in the chain. If we don’t pass the request it will never complete, and will eventually hang. The view is the application interface, or what a user sees when they open your app. 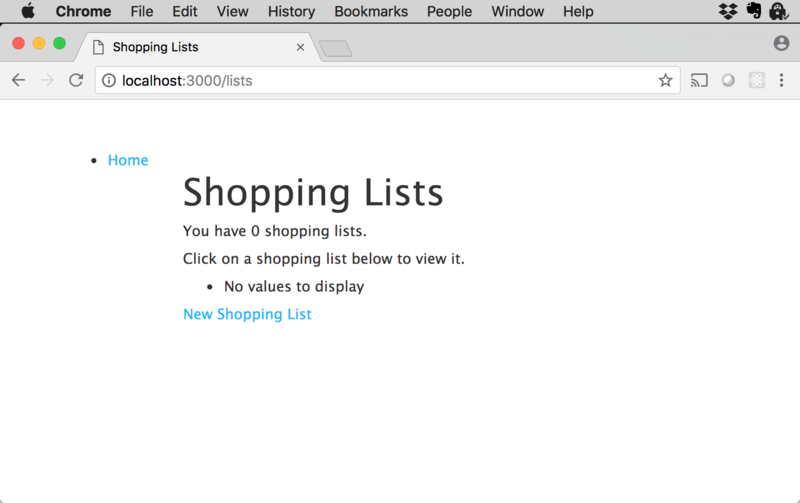 So far, the Shopping List application has been a collection of REST services; useful, but not very exciting to a user. So, I created a GUI (graphical user interface), which we’ll explore in this section. Express has a pluggable view template processing architecture, which means it uses a template engine, along with templates, to render views. Users interact with these views. The default template engine is Pug, which we’ll explore in this unit. A Pug application typically defines one or more default layout pages, which your other pages will extend. This template provides a responsive GUI, and uses Bootstrap, too! Each view in the Shopping List application has a route associated with it, as summarized below. For better code readability, you should give your router module a name that matches the part of the path it is used to route. In this case, /lists is the path, and so lists.js is the module name. All routes whose URL path matches /lists will be forwarded to the lists router. The router will examine the remaining part of the path to determine each route’s final destination. Whenever the /lists path is matched, the listsRouter (in the lists module) is invoked to map the remainder of the path. Listing 5 shows the /lists routes in lists.js. Note that you don’t have to map the /lists part of the path again; you only need to specify the part of the path after /lists. The path portion of this URL will match both of the /lists routes above (lines 11 and 13, respectively), but the controller function depends on the HTTP method specified in the request. If the GET method is specified, then listsController.fetchAll() will be called. If POST, then the listsController.create function will be invoked. Render the GUI, which the user uses to input data. Validate the data and forward it to the REST service. You’ll learn about data validation in the next section. For now, let’s look at how pages are rendered. The controller module for the lists router, called lists-controller, has a function for each route. Below is the listsController.create() function. This function calls the render() function on the Express res response object. It passes the name of the page template, along with a JSON object that contains the data for the page. Note: In a typical Express application, views are located in a ./views folder immediately subordinate to the project root. The Pug template containing the page source is called lists-create.pug. It’s shown in Listing 6.
p Enter required fields and click the Save link to create your new shopping list. This template extends the one you saw in Listing 4, called layout.pug. The lists-create.pug template provides capabilities that extend that base layout. Now look at the Pug syntax. Each HTML tag has a Pug attribute that mimics it. 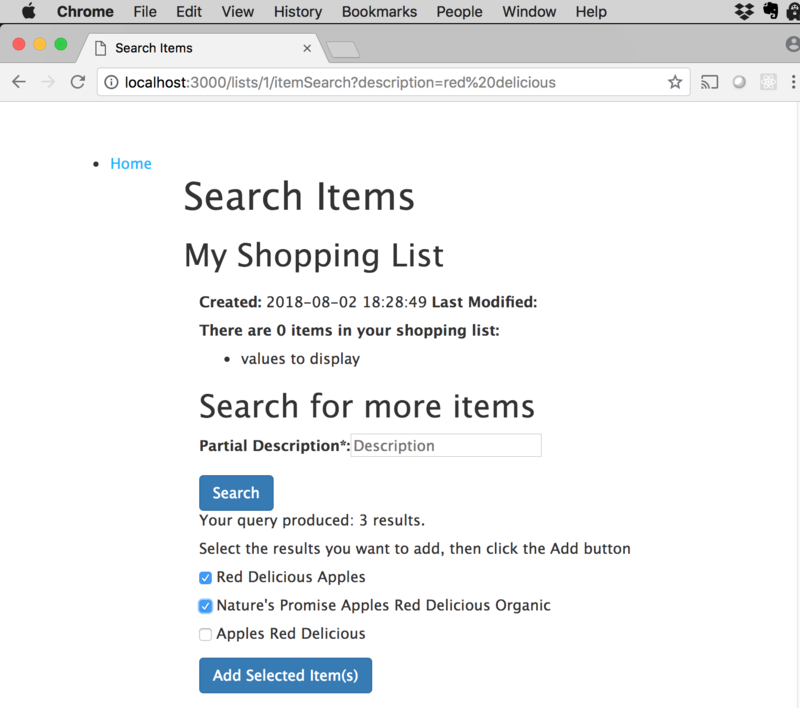 The page is pretty simple: It contains an h1 for the page title and some instructions in a paragraph tag, followed by a form to allow the user to enter a description of the new shopping list to be created. Validate and sanitize the data. Invoke the REST service to create the shopping list. We’ll need more than a single function to perform all of these actions. The createList function is actually a function chain, meaning an array of function calls. 18     // All is well (if we got this far). Send the request! The data is validated and sanitized in lines 3 and 5, then the validation results are computed in their own req/res/next callback (lines 7 to 17). If the request is deemed valid, the /rest/lists REST service is invoked to create the list (lines 20 to 21). If an error occurs (line 22), the request is sent to the next middleware for handling (line 23). If the request is successful, the browser redirects to the /lists route (line 26), which takes the user to the main page. Data validation is a fairly tricky problem to solve, especially in the context of a web request. Fortunately, express-validator plugs into Express and solves the problem for us. The validator’s first task is data validation. It uses the above rule to validate the description attribute in the JSON request, using the isLength() validator to ensure the description is at least one character long. This rule ensures that if the user does not enter a description, they will see the error message Description cannot be empty. In this case, you want to trim any whitespace and escape all potentially harmful characters. See the express-validator docs to learn more about data validation and sanitization. A good place to start is with the check API, used here to validate the request body. There’s one more step to data validation, which is reporting errors to the user. Once again, express-validator comes to the rescue. Rendering the page containing errors to the user, along with a message. Looking back to Listing 7, line 8, notice the call to validationResult(req), passing in the request object. From this call, express-validator returns a validation result. The object is converted to an array (line 10), and the original page is re-rendered, passing the errors object in the JSON data (line 12). 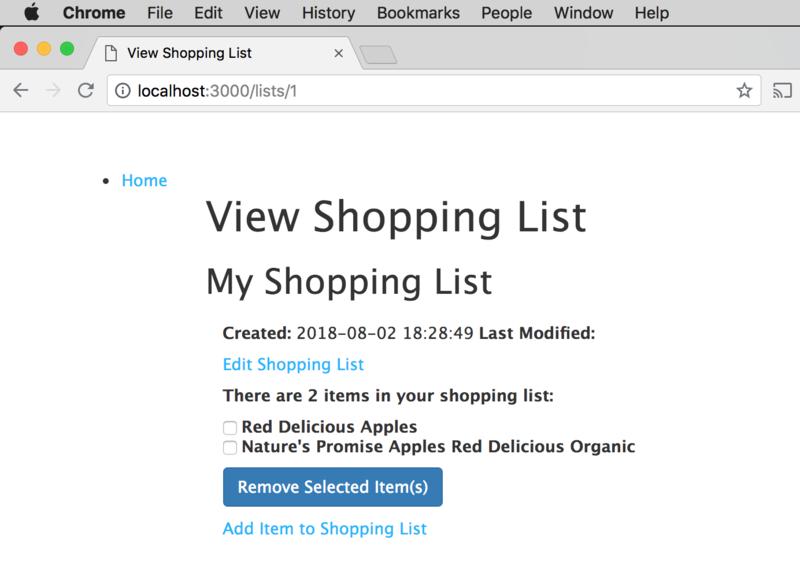 You’ve seen how Express handles routes and renders pages for the Shopping List application. Now’s your chance to run the application and see it the way a user would. Run npm install to install all the packages you’ll need. Next, load the data into the database by running npm run load-db (this command takes a few minutes, so be patient). Then, run npm start to start the application. Select a couple of items, click the Add Selected Item(s) button, and they’re on your list! In this unit you learned about Express middleware, routing, and processing view templates with Pug. You also got started with data validation and sanitization using express-validator. 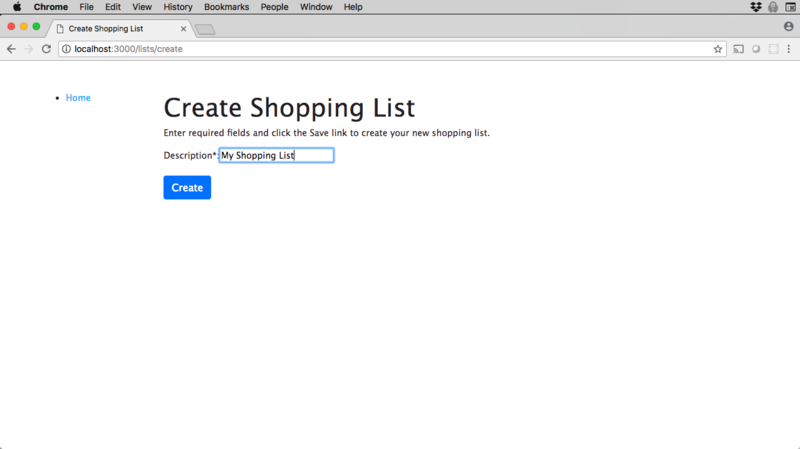 Make sure to get the source code for the Shopping List application, run it, and play around with it. There’s no substitute for running code to learn how code runs (feel free to quote me on that). 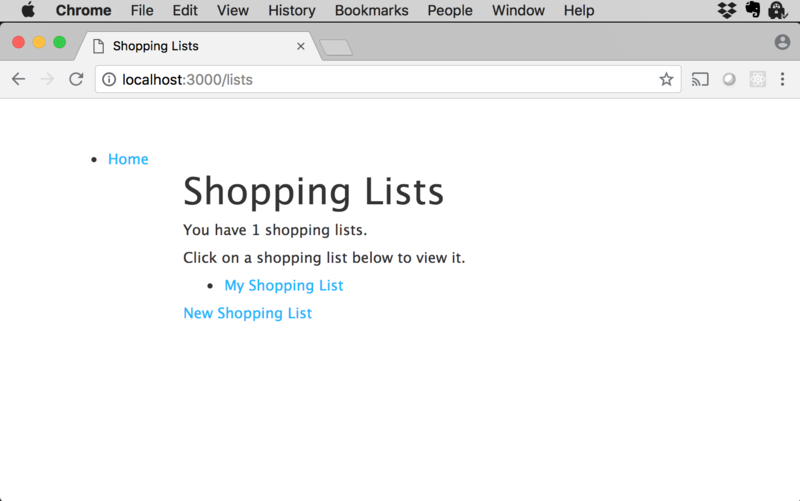 You can also watch the video to see the Shopping List UI in action. In this video, I show you those improvements which involve using ExpressJS for a web framework, which includes routing, and Pug for the user interface. Express.js Fast, unopinionated, minimalist web framework for Node.js. Bootstrap Build responsive, mobile-first projects on the web using Bootstrap.